C.W. Hatch is the umbrella organization for a number of web enterprises. These enterprises can be divided into two categories, media and marketing. The media category encompasses several web publishing enterprises, which include general interest publications as well as specialty content sites. The marketing side of things is related to several lines of products, some of which are held in inventory as well as other product lines marketed strictly on a drop ship basis. Additionally we have marketing partnerships that operate on an affiliate basis. C.W. Hatch is always eager to explore and evaluate promising partnership opportunities with all types of companies, from those already well-established on the web to those looking to expand into to the area the internet. 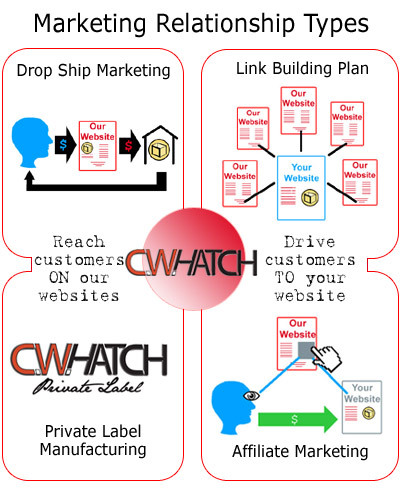 CWHatch.com's marketing expertise also includes Search Engine Optimization efforts. We have experience with all aspects of optimizing our own pages and the sites/pages of others to ensure high placement within search engine query results for targeted keywords. We are also experienced in incorporating shopping comparison site product feeds into the overall marketing and SEO strategy (for e-commerce companies). The C.W. Hatch firm is expert at devising and implementing strategic plans for web based internet businesses, especially small businesses and internet start-ups. Specializing in leveraging content to maximize user experience while simulataneously maximizing monetization of site pages, our approach to internet ventures is comprehensive, balancing the big picture with the minutia of technical details. We bring creative thinking and energy to bear on even the most mundane challenges.